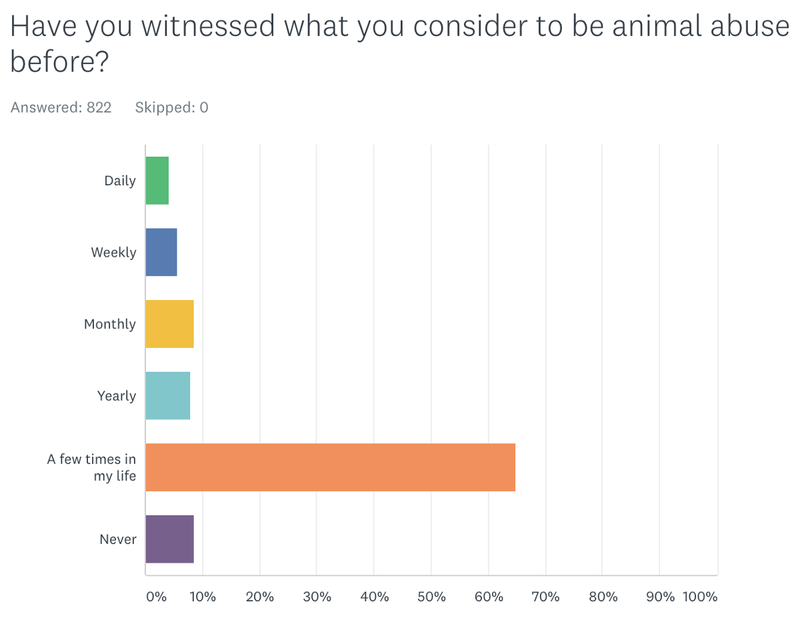 Most of our 822 respondents are big animal lovers, and nearly all of them have witnessed animal abuse before. Almost 20% reported seeing abuse on a monthly basis or more frequently. Respondents are very concerned about animal abuse and are almost unanimously in support of doing more to prevent it. They think this doesn’t get enough attention and the current laws and enforcement are not enough. Did people grow up with pets? What kind of pet people are they? Have they seen animal abuse before? Feel bad for these animals? Concerned? Should we do more? Did you see Idaho was recently reported one of the most pet-friendly states and #1 on dog-ownership? We love our pets. But that doesn’t mean they’re all treated properly. Animal abuse is something that happens all the time, and some find it very concerning. I wanted to know what people think about this topic. We had a lot of first-time respondents on this survey (woot! ), but that means we lack some demographic history for them. But that’s okay. Of those that we do know their demographics, we heard from more women than men, about an equal spread across age groups, mostly Ada county residents, and almost entirely people that currently own pets. To get started, let’s get a sense of how familiar with pets people are. I had a hunch that their views on animals and pets might be influenced by whether or not they had pets in their lives growing up, so I wanted to ask. About 90% said they did! 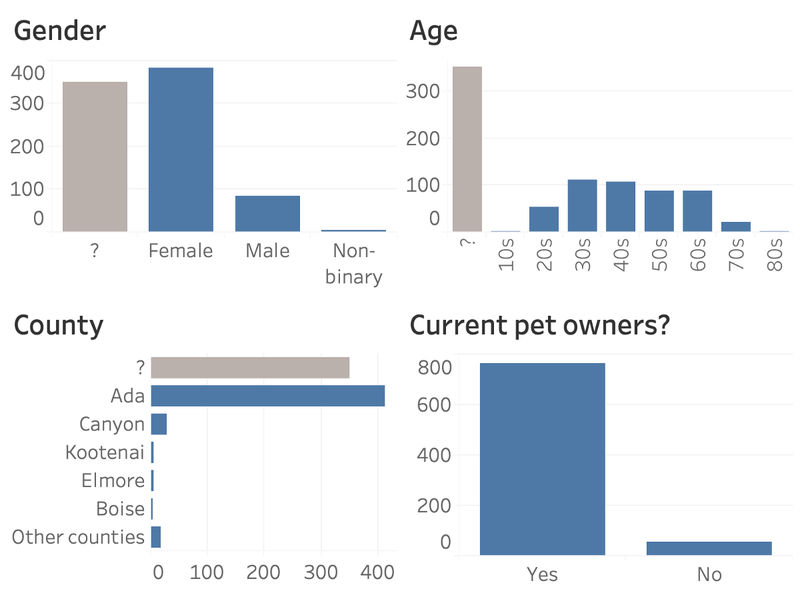 This is telling me that our respondents aren’t “average.” According to this article, Idaho has about 70% of households owning pets, so we’re hearing from a particularly pet-experienced group. Now let’s look into how many pets they have currently. 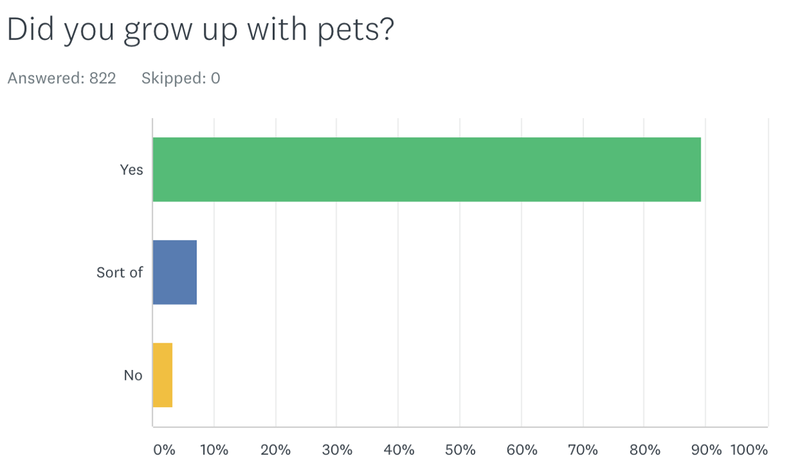 Up in the demographics, we saw that about 95% of our respondents currently have pets, but I wanted to see how many each respondent has. 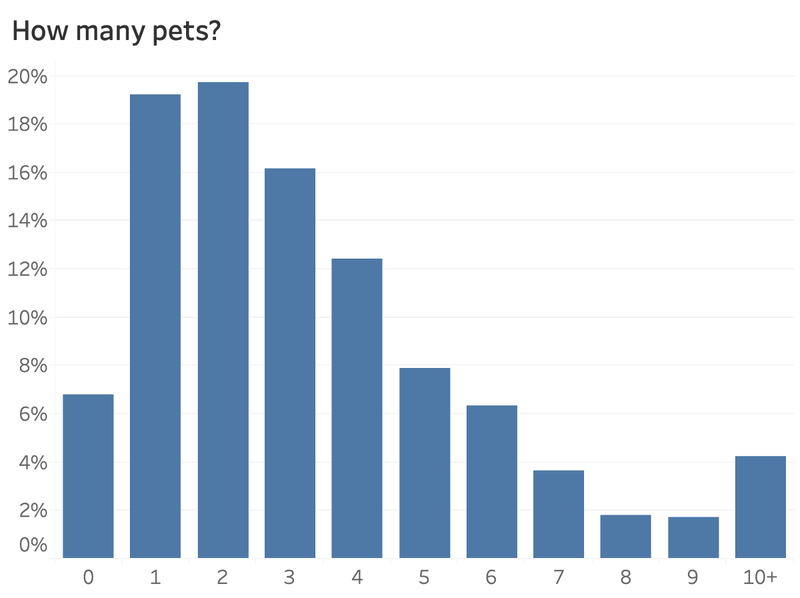 In the overall results, I asked whether each respondent has 0, 1, 2, or “3 or more” of each of the most popular types of pets. Then I added up their answers across all the categories for a total number of pets that each respondent owns. And about half of the respondents have 3 or more pets total! And about 5% of our respondents have 10 or more. That’s more pets than I expected! Next, I was curious to know if our respondents are cat or dog people, or something else. 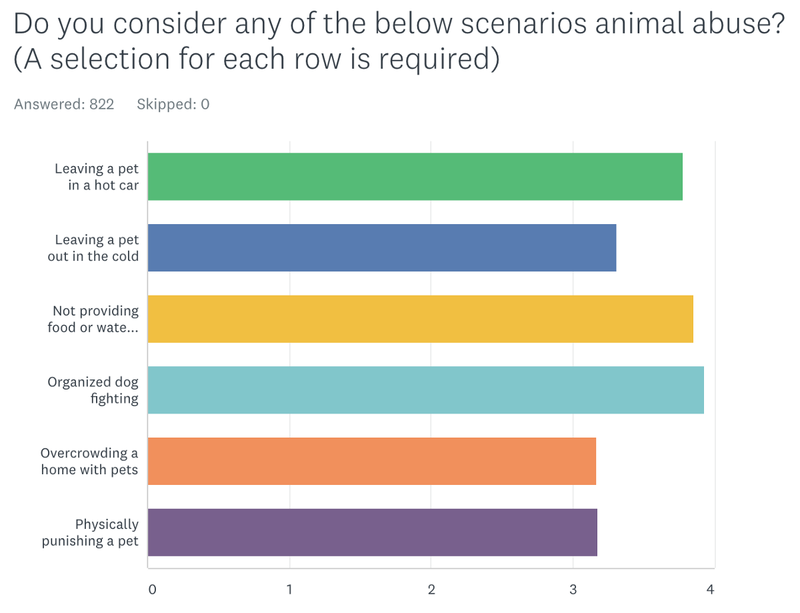 The overall view tells us how many people have certain amounts of pets, but it doesn’t tell us which pets individuals have the most of. But, I can calculate that! 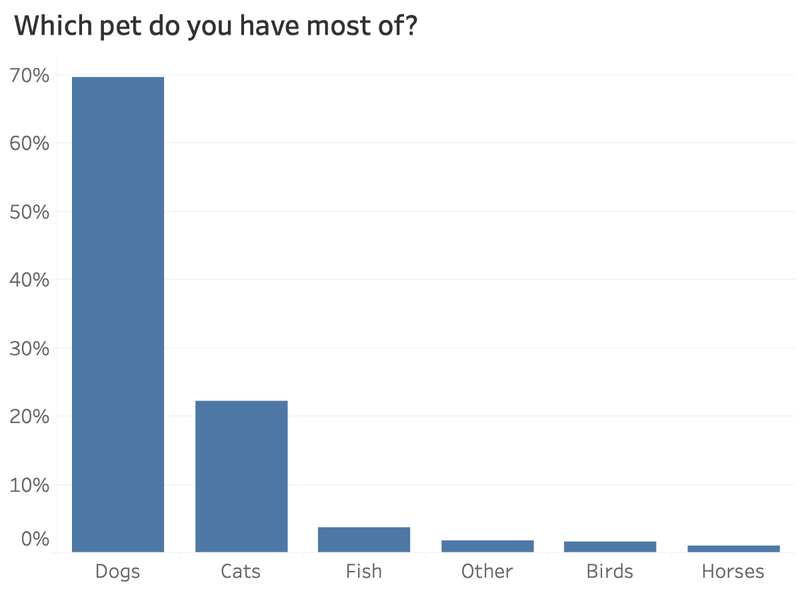 It turns out that 70% of our respondents have more dogs than any other type of pet, about 20% have more cats, and 10% have more of other kinds of pets. Now we have a good grasp on context about our respondents. Let’s get in elements of abuse. First, and I think most important to people’s perceptions about animal abuse is whether or not they’ve actually experienced it themselves. The overall results show us how often people have experienced what they consider to be animal abuse. Most mentioned they’ve seen it only a few times in their life, and a few admitted to never experiencing it, but about 25% notice it at least on a yearly basis. About 7.5% even mentioned witnessing it on a daily or weekly basis. Those folks must have some abusive neighbors? I wanted to break this down by a demographic to see if there are any interesting patterns. I thought age might be interesting, given that perspectives on what animal abuse is could have generational differences — there were some comments indicating that rough treatment of animals may have been more tolerated in the past. 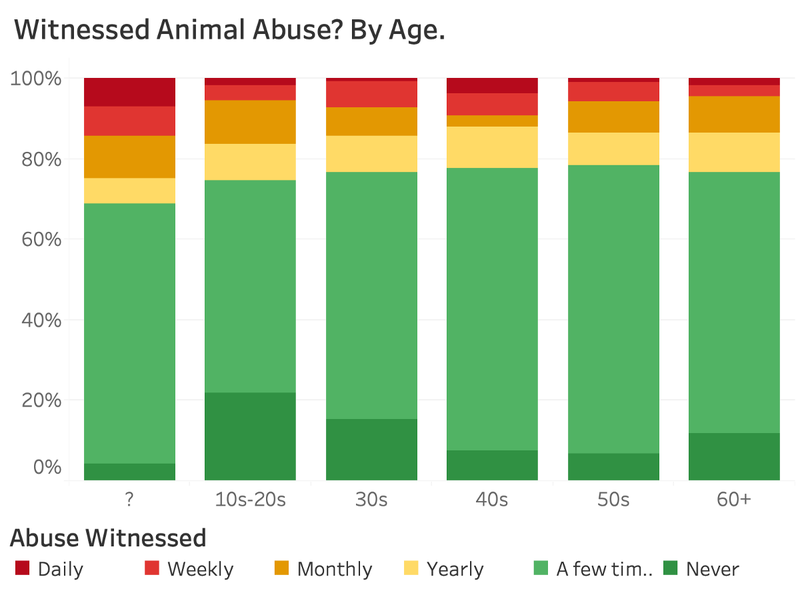 But there doesn’t appear to be much of a difference across respondents’ ages — people witness animal abuse at about the same amounts. I think the only thing worth mentioning is that there’s a bigger group in the 10s-20s age group that have “Never” witnessed it. That makes sense to me — they’ve had less life experiences where this might have occurred. Now that we’ve talked about whether people have seen it or not, it’s worth discussing what it is. This seemed a little tricky to do in survey questions, so I decided to outline a few scenarios and see how people thought about each one, whether it’s Always, Sometimes, or Never abuse. This weighted average chart shows us how the different scenarios compared overall. I found it interesting that 3 categories were almost tied for being considered abuse the most, and 3 were almost tied for being considered abuse the least. But let’s look at this in more detail. This view shows us the proportions of people that said that each scenario is “Always” or “Never” abuse, for instance. First off, I was surprised how many people said leaving a pet in a hot car is Always abuse. And I would have expected opinions on that one to be almost identical to leaving a pet in the cold, but they seem pretty different. Lastly, I thought people seem to be over-reacting to the “physical punishment” scenario — which is considered a best practice for training dogs. 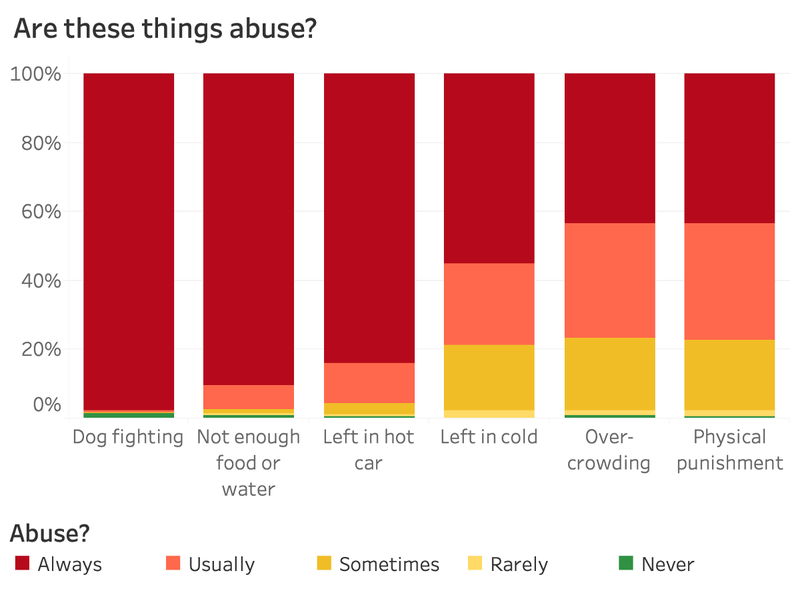 Even if you disagree with the tactic, I would have expected people to say it’s “Usually” abuse, not “Always.” I’m guessing the respondents aren’t thinking about a training use case as much as about people taking out anger on a pet whether they deserve it or not. We’ve been talking about pets mostly, but I wanted to go a little broader as well. 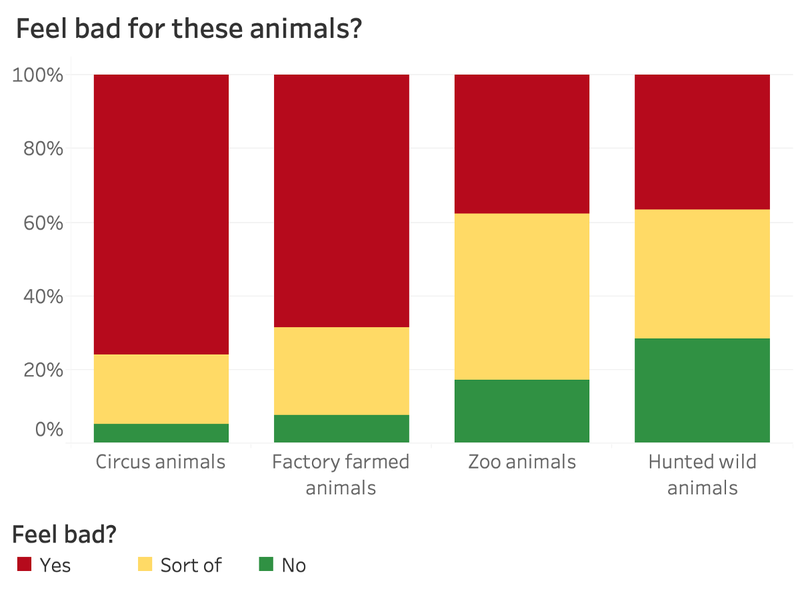 I asked respondents to share whether they feel badly about animals in different situations, like zoo animals, for instance. Let’s do a more detailed visual, like we did on the last question. The standout to me from this view is how much bigger the “Sort of” group is for Zoo animals. Seems like people are less sure how they feel about them, compared to the other groups. Given everything we’ve asked, I wanted to arrive at the big picture — how concerned are you about this issue as a whole. And also, do you think more should be done to prevent animal abuse? The overall picture is clear — people are concerned and they want more to be done. This isn’t that surprising since we’re hearing from a group of engaged animal lovers. But one thing that stands out to me is that the proportion saying “Yes, absolutely,” more should be done, is quite a big bigger than those saying they’re “Extremely concerned.” To me, that means that even people that aren’t majorly freaking out about this issue think we should definitely do better. This next view overlays the two questions to get at this more directly. 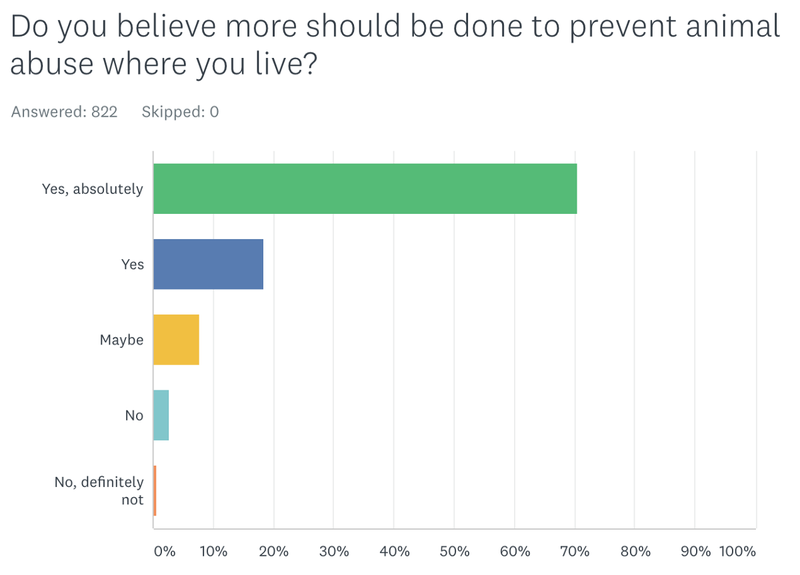 You can see how people think about doing more to prevent abuse, by how concerned they are. 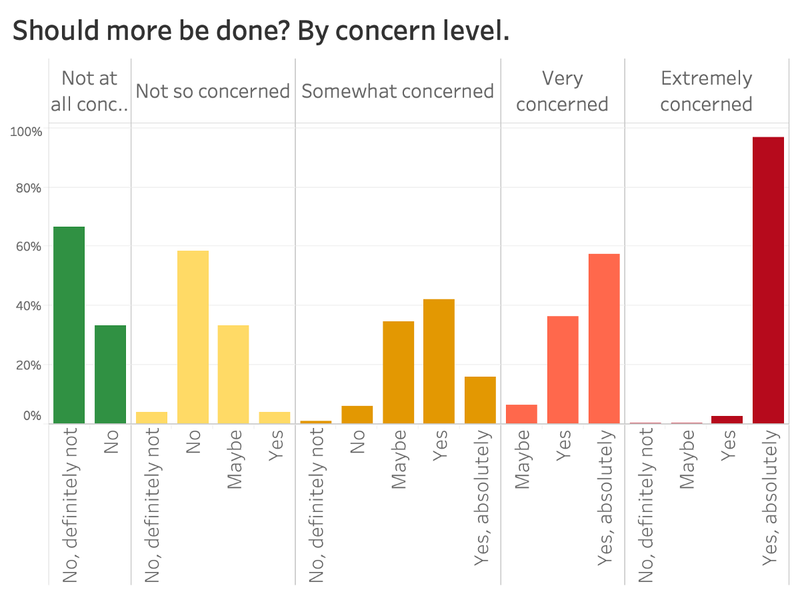 I think the most interesting thing here is the percentages of people that think more should be done that are only “Somewhat concerned.” Around 60% of them are saying Yes, with about 30% saying Maybe. To me, this looks like it could be pretty safe territory for elected leaders to act on. And while we’re on that subject — whether elected leaders should act on this or not — let’s compare this issue to other potential issues of interest. 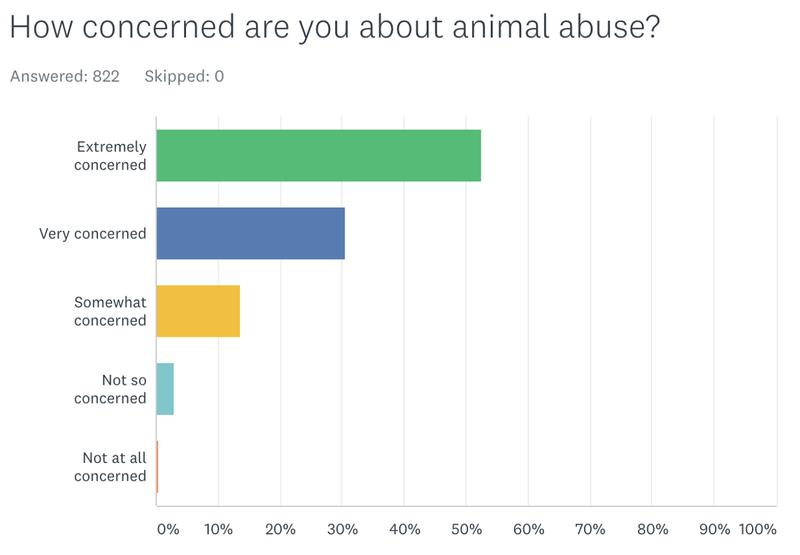 Overall, our respondents ranked Animal Abuse the most important issue. Land Conservation was considered the next most important, and Zoning and Permitting the least. Now, we’ve talked about this group of respondents not being “average” several times, but it’s worth reinforcing at this point. 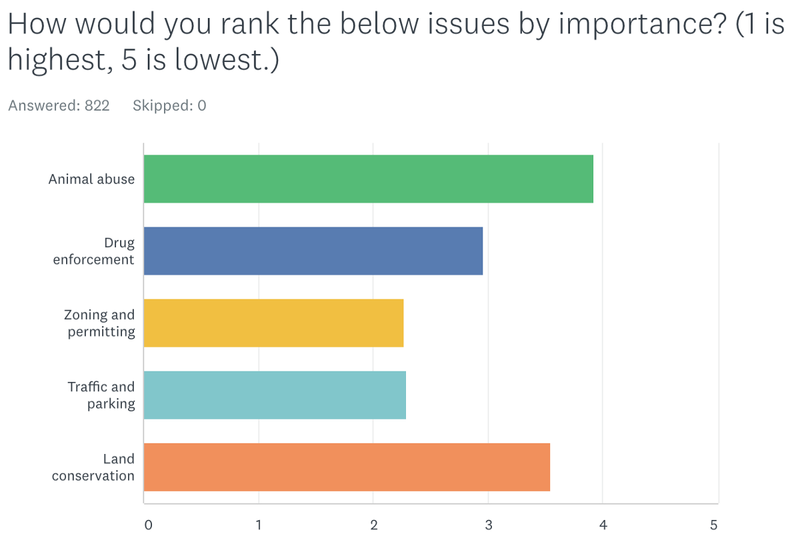 I think it’s very likely that this ranking would look different if we surveyed every Idahoan — I think the people that responded probably care more about this than the people that didn’t. 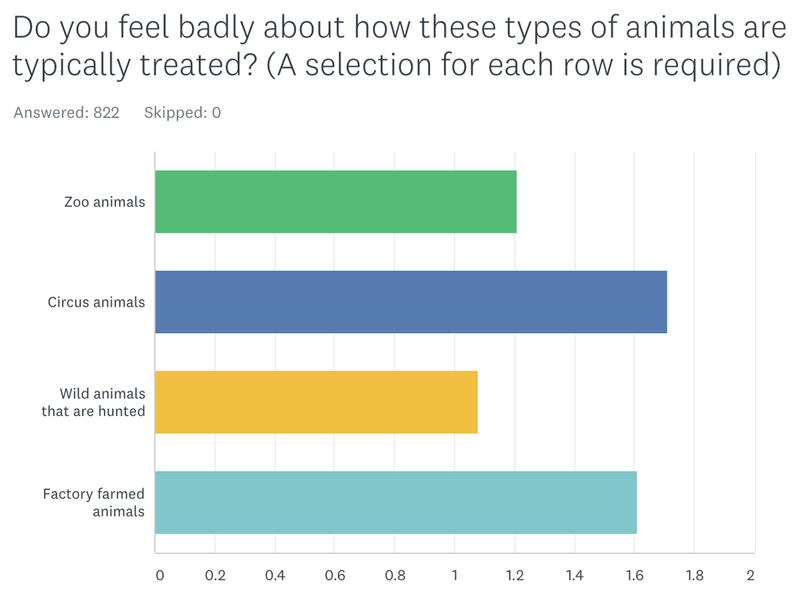 And, even for our respondents, they just spent a few minutes answering questions about Animal Abuse, so maybe they’re primed to rank this more highly than they might otherwise. So, we should consider this with a couple grains of salt. But the fact remains: the 822 people we heard from think this is really important, and many of them believe it’s the most important thing on this list. Dog fighting — it’s wrong and abhorrent, but it gets a lot of media attention while institutional animal abuse is occurring every day. Also trophy hunting. While I don’t necessarily agree with it, permitted and regulated trophy hunting can often bring more benefits to a community and reduce poaching, and Americans ought to respect the cultural and regional differences that make trophy hunting a beneficial activity for some communities. Busy bodies that make snap judgements about a situation they observe with understanding all of the pertinent details about it, such as timing, frequency, breed differences, and the specific needs of the individual animal. I think that sometimes animal rights organizations can turn people off because of how they present an issue. If they are too extreme in the delivery, they won’t reach the people who they are trying to change the minds of or make aware of an issue. People in different cultures who eat dogs and/or horses. I was really disgusted recently to see the amount of racism peddled by Americans who think they’re better than Korean people who eat dog meat. Like… have you met pigs? They are smarter than dogs, but Americans will happily incorporate bacon into every food group! Not to mention the fact that the US dropped thousands of tons (literally) of bombs on the Korean peninsula in the 1900’s and starving people were forced to eat wild dogs to survive. So perhaps we should all mind our own business and resolve the incredible inhumanity of American animal agriculture before casting stones at people across the globe. Hunting? Have you seen the winter cow and calf kill rates and/or any number of wilderness deaths for any animal when tag limits are not met? You can find it easily on the Idaho Fish & Game website. Hunting and angling is the only means by which wildlife are managed in the State of Idaho, all paid for by hunting/angling permits, tags, and fees, not with tax dollars. To suggest that our hunters and anglers are somehow mistreating animals completely ignores the important role they play in ensuring healthy wildlife populations in this state, nation, and world. Also, urban animal lovers tend to be removed from the harsher realities of wilderness and wildlife and also overplay the role of animals as family members. When you grow up on a farm and know that the meat you are eating mooed, squawked, or oinked the day before it sat on your plate, you begin to realize that treating animals as though they are on the same plain as humans is short sighted. Those who suggest vegetarianism/veganism do not consider the world hunger issues that make that approach morally/ethnically/culturally bankrupt. Cut factory farmed meat down, yes, but rule out meat as an omnivore altogether, a tragic mistake. What gets too much attention? Stories of “pit bull attacks” half the time that’s not even the dog, the story is extremely old and it’s reaching. People who think pit bulls are bad dogs are just as much guilty of animal abuse. PETA. I know they fight for animal rights in general, but their approach is extreme and idiotic. There are sensible organizations out their who do a lot of good for animal’s rights, but they get overshadowed by PETA’s extreme and dehumanizing tactics. Folks tend to worry more about what is happening to traditionally companion or “cute” animals and less about the welfare of all critters. Some things that are not animal abuse. Using an eCollar -when done right is not animal abuse, leaving a husky outside in the cold (that is used to it) is not animal abuse when the same temp it would be for a greyhound. Animal abuse is about the health of that individual animal not blanket laws that cover animals with very different needs. There needs to be more attention. Animal abuse is a known precursor to human abuse, besides being a sub-human activity. We are responsible for their well-being. They are not our punching bags. Leaving a dog that was bred for cold weather tolerance outside for more than 1/2–1 hour during winter months. The Great Pyrenees, St Bernard’s, etc, that I know prefer to be outside, especially when it’s cold out. They do need to have shelter, food and liquid water available while outside, but don’t need/want to be inside all the time. Summertime they need to be kept cool to stay healthy. Short-haired breeds that don’t have that undercoat insulation? They should only be outside for short periods of time, under supervision, when it’s cold. They can die just as quickly from the cold as they can in a car during the summer. Nothing! We live in a state that every time they put something on the ballot to make animal abuse they link it with something about gun control and hunting and, Boom! It gets defeated! It’s a fact that people who abuse animals go on to bigger and better crimes but here in Idaho we seem to want to be deaf, blind and ignorant about it. Animals are living beings with feelings and needs just like people. Own a dog, cat even a fish and you will understand that! Anyone who has so little regard for those we share this world with need to be prosecuted to the fullest extent of the law. And animal abuse should be a felony!!!! “Abuse” in agriculture that isn’t actually abuse, someone just doesn’t agree with the practices or knows very little information and twists what they do know. Negative spotlights on community shelters that are doing the best they can. Shelter bashing is a pet peeve of mine. Nothing in Idaho gets too much attention. Idaho animal laws are the worst. Animal crimes and theft are becoming some of the easiest to get away with for criminals. And charges don’t seem to stick because penalties aren’t stiff enough. Dog owners with too many dogs, the wrong breed of dog for their home situation, and dog owners that are not responsible for their pets waste. Boise is becoming covered in dog poop because we are a “dog friendly” city. City parks, foothills trails, Greenbelt paths, and homeowner’s yards are increasingly littered with it. Pet friendly stores and eating/drinking establishments have become a joke as dogs fight, bark, growl at each other, as is typical. It’s clearly gone too far. Pure breeding dogs is often terrible for them. For instance English bulldogs have been bred so that almost all have to be given birth by cesarean section and they have terrible breathing problems. I don’t think it’s quite abuse, but it’s not a good thing at all. The impact of large farms and agriculture. When people think of animal abuse, they often think of cats, dogs, etc. Those we would expect to see in our homes. In reality, the majority of animal abuse that happens in the U.S. is located in the farms that produce our meat, eggs, and dairy products. If one chooses to consume these products, they can take steps to do so in a responsible way, that doesn’t harm other living beings. Institutional animal abuse that is legal, such as certain factory farm practices and “puppy mill” operations. It’s up to us as consumers to demand regulations that ensure animals are being treated humanely during their lifecycles. Also I think Americans have a hard time culturally getting on the same page about what really constitutes animal abuse, and that hinders productive debate about how to actually improve the well-being of animals. Education about how to take care of pets (which includes having them spade or neutered). Our animal control department is pretty small. Maybe we could beef up on units that can investigate and work with pet owners to educate and inform, or remove pets completely if if the abuse is extreme and/or the owners are not willing to consider changing the way they care for their pets. I think most caring people are aware of the obvious cases of animal abuse such as dog fighting and hoarding situations. But there are every day instances that many are either not aware of or do not think that it happens that often. Such as, people who move and leave their pet behind or drop them off in a field somewhere and think that the animal will be able to fend for itself. Not having your pet spayed or neutered and adding to the overpopulation of unwanted pets at the shelters and rescues. Driving with a dog unsecured in the back of a pickup truck. Leaving your dog in the car when it is summer in Idaho — it doesn’t matter that you have the window open 2”. Not having adequate shelter for dogs and cats who are left outside during freezing temperatures thinking that because they have fur, they are fine. Factory farming. This affects millions and millions of animals. We need to change the conversation and the culture from just go vegan to regulations to demand humane treatment of food animals. Overcrowding a house with animals. My uncle has 14 dogs. I’ve never heard anybody say that that was animal abuse before, but it probably is. Many animals are dumped — especially out near Jerome. My own dog is a rescue of this. Contact Anythings Pawsable Foundation Inc. — they deal with animal abuse daily. Neglected neighborhood animals. Our current animal control office is so busy they don’t have the resources to come check on animals that are habitually mistreated animals. The state requires significant proof of mistreatment over a long period of time before it focuses its efforts on an abuser. Obese animals... It should be considered animal abuse to have a animal that can barely walk or do anything without struggling due to weight issues. Confined animal feeding operations (CAFOs), which represent the majority of meat and dairy raised in the US, which have horrendous conditions for the animals. Frequently, there is little room to roam, and the routine, regular use of human antibiotics on all animals within the CAFO really causes a lot of alarm. Many things, but I would say the hunting of endangered wildlife is not talked about much in Idaho. Like the hunting of mountain lions. Most people need education about what abuse is. I have seen my neighbor beat his dog. I suspect he doesn’t know anything about how to train an animal. People letting their dogs run free all the time. It’s dangerous for the dogs. It can be dangerous for people since over half the dogs in Boise are poorly trained and poorly socialized. I’ve been chased by dogs weekly in my neighborhood and am sometimes afraid to leave my house or go on walks. Animal control is hesitant to come out and issue tickets or catch the loose dogs. Boise residents think this is an acceptable way to live. People owning pets and not taking care of them, i.e. leaving them outside in cold, not feeding. Also, another topic I feel strongly about is leashing dogs. I’m this city, people feel they are free to let dogs roam freely it seems. This is so unsafe for the dogs, other dogs …as well as people walking down the street. People can be hurt by jumping dogs and biting. I witnessed a dog being run over by a street cleaning vehicle because it ran out in front of it. The owner witnessed it too…the owner didn’t have the dog leashes in a downtown busy area. The dog did not survive. This is an example of indirect animal abuse in my mind. Thanks for taking on this topic. The most common abuse I see is people who think hitting a dog is training it, and this is very widely accepted. Believing in “alpha dogs” and “dominance” is also abusive and utterly without scientific merit, it’s just a socially accepted form of abuse. Animals that go without medical treatment, either because of the financial circumstances or apathy of the owners. What the sheep ranchers are doing. They breed Great Pyrenees puppies and when they have enough, they abandon both mother and babies in the mountains for bear, wolves and other predators to kill. My sister does animal rescue and has had pups and moms who were saved brought to her. This is extreme abuse that most people don’t know about. All of it. Idaho ranks last or nearly last in the US for lack of punishment for animal abuse. It’s disturbing to me that more is not done to safeguard innocent animals. The lax laws surrounding animal abuse. Sociopaths prey on the vulnerable and often start out by abusing animals. What kind of society are we promoting by tolerating cruelty to animals? The fact that pet stores are allowed to continue buying dogs and cats from backyard breeders and puppy mills whose breeding practices are anything but kind. I consider this one of the worst forms of abuse! Dogs and cats being breed till they cant produce and then literally dumped to fend for themselves!! This needs to be stopped NOW!! This contributes to feral cat populations, overcrowding pet shelters whose only recourse if they can’t find rescues or adoptive families for these poor animals is euthanasia! How many cats and dogs get killed on property but nothing’s is accomplished because pets are considered “property” here. Shooting neighborhood pets, and any abuse is an obvious sign of a mental problem and leads to abusing people and should be taken more seriously. The frequency of abuse, the lack of laws, the lack of enforcing laws, the lack of response to complaints, the abuse and poor attitude by enforcement officers, and THE LACK OF LAWS WITH STRENGTH. Idaho is truly not pet friendly. Ask any renter. The reporting of number of dog parks was not straight forward. Most places are small fenced, bark covered ground. No amenities for pups or owners. The rest of Boise’s parks are temporary dates and times. Meridian and Nampa each have one. The relationship between animal abusers and domestic abuse. There is frequently a correlation between animal abusers and domestic violence. Often, threats and violence against a beloved pet are used as tools to abuse or manipulate a romantic partner. Better protection for animals (eg, prosecution of abusers) might help provide better protections for women and children. Allowing women to bring pets to a shelter with them can help them be able to leave. The testing of products on live creatures. They will some times tie rabbits down to special tables and literally rip the fur out at the root to expose the skin for makeup products. Also, cart horses. They live such a sad existence. Individual cruelty cases. Pets left out in extreme conditions. We reported a neighbor, as did others, several times. Nothing was done. Also outfitters. A local one posted that they quickly treed a cougar, but that they didn’t want the “fun” to end so soon for their hunting party so the dogs kept the cat treed all night and they killed her in the morning. That was acceptable apparently. That animal spent a night in terror so they could anticipate killing her. So hard to think about. People who are caught abusing an animal should have much bigger consequences. Such as Prison time, high bails, and longer probation times. They should also be put on a list just like child molesters. The facts and statistics that most serial killers, habitual child and spouse abusers, etc, have shown/started out with severe abuse tendencies toward animals. Protecting people’s property. We had a local stray cat program steal our cat for 11 days and clip it’s ear. She also took the neighbors. Ours was already chipped, already neutered and we live on 22 acres in the country . She had no business taking it upon herself to take our cat without checking to see if it had an owner. Dog fighting rings around here still being active, pets being stolen and taken from “free” ads for these. Horses and dogs neglected, chained, lack of medical care, and even with reports to authorities many times nothing can be done. Minimum requirements need to be raised for these animals. Leaving pets outside in the cold or heat without proper shelter. Recently a county sheriff in northern Idaho informed me that even a leafy tree could be considered shelter. THIS IS NOT GOOD ENOUGH!!!! People that starve their dogs to death and get let go without punishment. People who chain their dogs up 24/7. There needs to be better defined laws regarding what constitutes shelter, and what requirements there are to have outdoor animals. There also absolutely needs to be laws regarding breeders. Anyone selling puppies or kitties should be required to report all income to the IRS, and have to obtain a license to breed. The number of backyard breeders is astronomical. Better and cheaper spay and neuter programs would help with the breeding problems as well. I do not think the general population understands that there are almost no enforceable laws on the books that protect companion animals. Even if there were, there is not enough money allotted in the budgets (City/County/State) to train law enforcement, pay for animal control officers, prosecute offenders and shelter animals. Lack of training for law enforcement, prosecutors and judges, so that they can conduct professional and complete reports on cruelty investigations and judges and prosecutors understand the laws to bring down sentencing on defendants.